Fusion harnesses the reaction that powers the sun itself, holding the promise of eventually producing clean, abundant electricity using a fuel derived from seawater—deuterium, a heavy form of hydrogen, and lithium—so the fuel supply is essentially limitless. But decades of research toward such power-producing plants have still not led to a device that produces as much power as it consumes, much less one that actually produces a net energy output. Earlier this year, however, MIT's proposal for a new kind of fusion plant—along with several other innovative designs being explored by others—finally made the goal of practical fusion power seem within reach. But several design challenges remain to be solved, including an effective way of shedding the internal heat from the super-hot, electrically charged material, called plasma, confined inside the device. "If we didn't do anything about the heat exhaust, the mechanism would tear itself apart," says Kuang, who is the lead author of the paper, describing the challenge the team addressed—and ultimately solved. But the new MIT-originated design, known as ARC (for advanced, robust, and compact) features magnets built in sections so they can be removed for service. This makes it possible to access the entire interior and place the secondary magnets inside the main coils instead of outside. With this new arrangement, "just by moving them closer [to the plasma] they can be significantly reduced in size," says Kuang. In the one-semester graduate class 22.63 (Principles of Fusion Engineering), students were divided into teams to address different aspects of the heat rejection challenge. Each team began by doing a thorough literature search to see what concepts had already been tried, then they brainstormed to come up with multiple concepts and gradually eliminated those that didn't pan out. Those that had promise were subjected to detailed calculations and simulations, based, in part, on data from decades of research on research fusion devices such as MIT's Alcator C-Mod, which was retired two years ago. C-Mod scientist Brian LaBombard also shared insights on new kinds of divertors, and two engineers from Mitsubishi worked with the team as well. Several of the students continued working on the project after the class ended, ultimately leading to the solution described in this new paper. The simulations demonstrated the effectiveness of the new design they settled on. "It was really exciting, what we discovered," Whyte says. The result is divertors that are longer and larger, and that keep the plasma more precisely controlled. As a result, they can handle the expected intense heat loads. "You want to make the 'exhaust pipe' as large as possible," Whyte says, explaining that the placement of the secondary magnets inside the primary ones makes that possible. "It's really a revolution for a power plant design," he says. Not only do the high-temperature superconductors used in the ARC design's magnets enable a compact, high-powered power plant, he says, "but they also provide a lot of options" for optimizing the design in different ways—including, it turns out, this new divertor design. 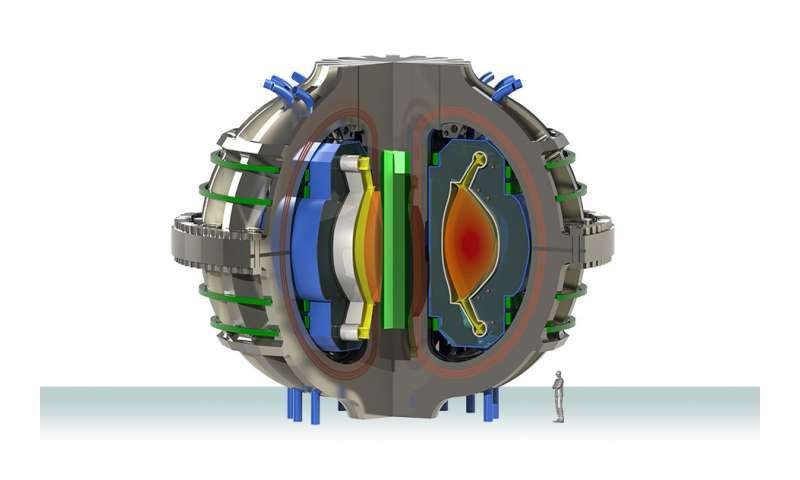 "This is opening up new paths in thinking about divertors and heat management in a fusion device," Whyte says. Construct a Fusion Plant adjacent to a Small dying Volcano; Then, use an exhaust pipe to eliminate the excessive heat into the Chamber of the dying connected Volcano ! be, I know I'm going to regret asking. But, Why? Anyone know how the Lockheed Martin (LM) high beta fusion reactor is progressing? - or they are making great progress and want to keep it on the QT? I suspect the later being the more improbable. Just curious? IF you had a million dollars, how would you spend it? IF there was the possibility of actual fusion, what would house it? Daydreams are nice, hydrogen leaf is a possibility, not a day dream. Correction to above is the word FISSION. Since the "product" of the reactor is heat, you don't really want to "shed" 20% of it. The exhaust is going to be sent along to a heat exchanger, where you'd capture as much of the energy as you can.